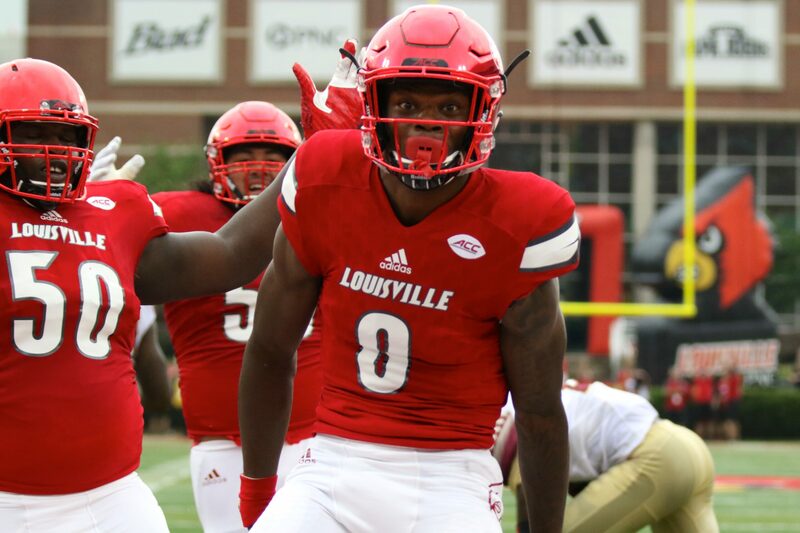 Lamar Jackson heads straight for the camera after scoring a touchdown. U of L is no stranger to producing NFL talent, generating players like Johnny Unitas and Super Bowl MVP Deion Branch in the past. This year’s NFL season proved no different as 20 professionals on current rosters competed for U of L football. Eleven of the Cardinals play on the offensive side of the ball with nine on the defensive end. Among those 20 players, five found themselves on playoffs teams. Two of the five are defensive tackle Sheldon Rankings and Heisman-winning quarterback Lamar Jackson. Selected 12th overall in the 2016 NFL Draft, Rankins has logged a fantastic year for the New Orleans Saints. He started all 16 games this season and racked up a career-high eight sacks and 40 total tackles. Rankins remained a staple for the 13-3 Saints in both the run and pass rush, helping to form the 14th-ranked defense in the league. New Orleans next faces the Los Angeles Rams for a chance to reach the Super Bowl, though Rankins will unfortunately miss out due to a torn Achilles tendon from his last game. The Baltimore Ravens selected Jackson as the 32nd pick in last year’s draft, the U of L standout glossed over by many a team. Throughout the draft process and preseason play, many NFL pundits argued that Jackson should shift to the wide receiver position despite his collegiate success as quarterback. Through the first nine games this season, Jackson primarily subbed for the Ravens on gadget plays involving running. An injury to starting quarterback Joe Flacco provided Jackson with the full-time starting position in week 10. Jackson would go on to prove his critics wrong by leading Baltimore to a 7-1 record and guiding his team to a playoff berth in the final game of the season against the Cleveland Browns. He still has room for improvement to be sure, but the Florida native proved his raw talent and explosive ability to ignite a professional offense. The Ravens ultimately lost to the Los Angeles Chargers in the Wild Card round of the playoffs, though Jackson confirmed his mettle as the youngest starting quarterback in NFL playoff history. Difficulties plagued the rookie throughout the contest before Jackson put his team in a position to compete with effective sequences. Jackson’s season-ending numbers were impressive, totaling 11 touchdowns with six passing and five rushing. He also posted the highest passer rating in the fourth quarter at 119.9. With Jackson returning as the expected starter for the Ravens next season, two areas of improvement are ball security and passing accuracy. He finished with 12 fumbles overall, the most in the NFL, and posted a 55.9 completion percentage in the regular season. Cutting down on turnovers is the main priority and, as Jackson gets more opportunities, his passing numbers should develop. The future is bright for these former Louisville players and more. Our series of Cards in the Pros will continue next week with a look at the NBA.